For, behold, the Lord, the Lord of hosts, is taking away from Jerusalem and from Judah stay and staff, the whole stay of bread, and the whole stay of water; the mighty man and the soldier, the judge and the prophet, the diviner and the elder, the captain of fifty and the man of rank, the counselor and the skillful magician and the expert in charms. And I will make boys their princes, and babes shall rule over them. And the people will oppress one another, every man his fellow and every man his neighbor; the youth will be insolent to the elder, and the base fellow to the honorable. When a man takes hold of his brother in the house of his father, saying: "You have a mantle; you shall be our leader, and this heap of ruins shall be under your rule"; in that day he will speak out, saying: "I will not be a healer; in my house there is neither bread nor mantle; you shall not make me leader of the people." For Jerusalem has stumbled, and Judah has fallen; because their speech and their deeds are against the Lord, defying his glorious presence. Their partiality witnesses against them; they proclaim their sin like Sodom, they do not hide it. Woe to them! For they have brought evil upon themselves. Tell the righteous that it shall be well with them, for they shall eat the fruit of their deeds. Woe to the wicked! It shall be ill with him, for what his hands have done shall be done to him. My people -- children are their oppressors, and women rule over them. O my people, your leaders mislead you, and confuse the course of your paths. The Lord has taken his place to contend, he stands to judge his people. 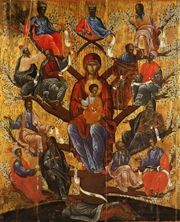 The Lord enters into judgment with the elders and princes of his people: "It is you who have devoured the vineyard, the spoil of the poor is in your houses."